This remarkable collection of almost 1,400 aphorisms was originally published in three instalments. The first (now Volume I) appeared in 1878, just before Nietzsche abandoned academic life, with a first supplement entitled The Assorted Opinions and Maxims following in 1879, and a second entitled The Wanderer and his Shadow a year later. In 1886 Nietzsche republished them together in a two-volume edition, with new prefaces to each volume. Both volumes are presented here in R. J. Hollingdale's distinguished translation (originally published in the series Cambridge Texts in German Philosophy) with a new introduction by Richard Schacht. In this wide-ranging work Nietzsche first employed his celebrated aphoristic style, so perfectly suited to his iconoclastic, penetrating and multi-faceted thought. Many themes of his later work make their initial appearance here, expressed with unforgettable liveliness and subtlety. 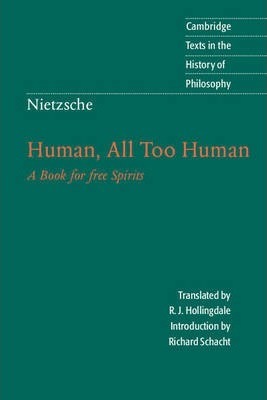 Human, All Too Human well deserves its subtitle 'A Book for Free Spirits', and its original dedication to Voltaire, whose project of radical enlightenment here found a new champion. Volume I: Preface; 1. Of first and last things; 2. On the history of the moral sensations; 3. The religious life; 4. From the souls of artists and writers; 5. Tokens of higher and lower culture; 6. Man in society; 7. Woman and child; 8. A glance at the state; 9. Man alone with himself; Among friends: an epilogue; Volume II: Preface; Assorted opinions and maxims; The wanderer and his shadow; Index.